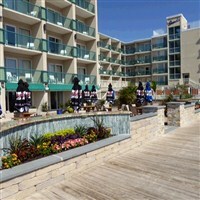 This tour combines some of the best summer shoreline and boardwalk fun that yu can imagine with wonderful hotel accommodations along with touring and sightseeing. There will be time to enjoy the beaches and boardwalks throughout your trip including world-class resort hotel amenities at the beautiful Harrah's Hotel and Casino. Although Atlantic City is known for its casinos, it is also a beautiful resort town wit a lovely boardwalk filled with thing to do along the beach. 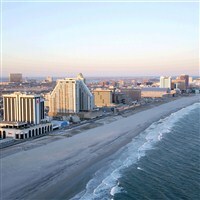 We will head east today to the resort town of Atlantic City located on the beautiful Atlantic Ocean. We are "stepping it up" a bit for 2019 and spending 3 gorgeous nights at the beautiful and upscale Harrah's Resort Casino Hotel this year located at the sophisticated marina setting in Atlantic City. Here you will find a world-class list of resort amenities at your fingertips. Along with their beautiful rooms and upscale buffet, this will be an experience you won't want to miss. You will have the freedom to come and go to the famous Atlantic City Boardwalk on Harrah's free shuttle which conveniently runs continuously to and from the boardwalk where there are unlimited choices for dining and shopping and enjoying the beach. If you enjoy a "good" walk, you will love the nicely paved and landscaped walkways which connect Harrah's Resort, the upscale Borgata Casino Hotel and the famous Golden Nugget. During your stay, your package will include a $25.00 slot bonus and five $10 food credits totaling $50 food per adult (to use as you wish). Be sure to check out Harrah's amazing and upscale Waterfornt Buffet filled with many wonderful food stations. Enjoy a free evening tonight to do as you please - welcome to Atlantic City! (Casino bonus can be subject to change beyond our control, although we do not expect any changes). Enjoy breakfast at your hotel this morning. Mid-morning we will depart for a delightful skyline boat cruise of Atlantic City where you will see this exciting area from the water - just beautiful. Enjoy a free afternoon on your own for lunch and by late afternoon, we will have a side trip (for thos interested) and arrive at Wildwood's exciting summer boardwalk area where you can eat, play and ride as you wish. Oh, those wild, wild, Wildwood days which include a wonderful boardwalk, shore amusements, nightlife, beach, and lots of summer fun...the perfect Jersey Shore town for a vacation. Did you know that Wildwood boasts more amusement rides than Disneyworld or Disneyland on its 1.8 mile boardwalk that is lined with eateries and games of chance? Take this chance to experience "the magic of a play land by the sea" as you can smell the aroma of cotton candy on a balmy summer night ounctuated with the sounds of seagulls and ocean waves lapping - simply a delightful time. We will return to Atlantic City this evening. Enjoy breakfast at your hotel this morning. 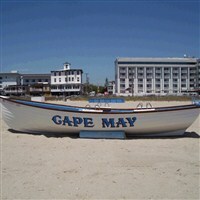 We will then depart for the Victorian town of Cape May filled with lots to take in. Picturesque and nostalgic, Cape May holds the distinction of being the oldest seashore resort in the United States and one of the most unique. It is an oasis of ambiance with its charming surroundings and the largest collection of authentic Victorian structures in the nation. We have incuded the best way to see this city aboard a delightful, narrated trolley tour. Your trolley guide will point out many of the architectural features along with many historical anecdotes that mark Cape May's past for an up close look at this area's history. We will give you some free time to have lunch on your own align with shopping at the delightful outdoor walking mall before returning to Atlantic City later this afternoon. Enjoy breakfast at your hotel this morning with free time in Atlantic City before we depart for home. Includes: Deluxe motorcoach transportation, 3 fabulous nights at Harrah's Resort Casino Hotel in Atlantic City, visits to Wildwood and Cape May along with touring as described, $25.00 slot bonus and five $10.00 food credit for total of $50.00 in food bonus. Note: Must be 21 years or older to receive casino bonus; casino bonus subject to change beyond our control although we do not expcet any changes.